Agent Holden Price didn’t have to go far to find his next case—it crashed right into his living room! Not only had the beautiful blonde lost control of her car, but if she was telling the truth, someone was also trying to kill her. As a recovery agent, he had an obligation to investigate. And he couldn’t deny that Mia Landers interested him more than she should. Nothing made sense to Mia—especially not the attempt on her life. 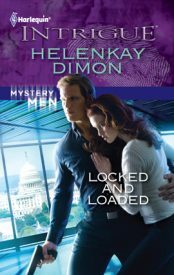 All she could do was trust Holden, the tall, dark and devastating agent who discovered that he and Mia had a common enemy…and a fierce attraction. 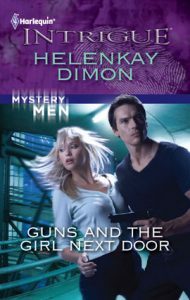 But in order to act on it, they’d first have to come face-to-face with their darkest fears and a deadly revelation that might put their newfound love on the line. Holden Price leaned his head back against his couch and threw his baseball in the air for what felt like the hundredth time. Much more of this and his catching hand would go numb. Being on paid leave was not his idea of a good time. More like torture. Up until two months ago he’d worked undercover with the Recovery Project, an off-the-books government agency fronting as an antique salvage operation. He found missing people for a living, those on the run who didn’t want to be found and those who were desperate for rescue. One case gone wrong and pencil-pushing higher-ups disbanded the Project and subpoenaed his boss, Rod Lehman, to Capitol Hill for top secret congressional subcommittee hearings. It all sounded like a load of bureaucratic crap to Holden. He spent his twenties in the Army and the first four years of his thirties at the Project. Without the routine of work the last few weeks dragged. He couldn’t remember ever being this bored. The ball thumped against his palm before he whipped it into the air again. The seam turned end over end as it traveled halfway to his family room ceiling. It ran out of ompf and began falling back down just as the lights on his outside alarm system flickered to life on the panel next to the door. Shrill beeps filled the room and kept right on cycling. When tires squealed outside the large double window across from him, Holden lifted his head. Saw the blinding headlights weaving and shifting straight up his lawn. The sights and sounds refused to register in his brain. By design, his cabin sat in the middle of nowhere. He dealt with dangerous people and life threatening situations. The unsettling mix had convinced him long ago to set up a sanctuary, a place of peace known only to a few friends who also happened to be gun-carrying colleagues. And now someone was violating the safety zone he created, using more than three thousand pounds of automobile as a weapon to do it. He scrambled off the cushion and grabbed for the gun in his side table. He hit the floor on his right shoulder just as the sedan smacked into and through his front door. The crashing boom rattled the cabin’s foundation. The wood creaked and splintered. Studs crumbled. The lights dimmed as the exposed wires fell from the smashed ceiling panels and pushed the electricity to the breaking point. With dust flying and pieces of furniture scattered everywhere, Holden sat still, his back to what was left of the couch and his gun aimed at the bowed head in the front seat of the car. Long blond hair mixed with the broken windshield glass even as the white knuckle grip continued its hold on steering wheel. His attacker was a she. She also didn’t have an air bag, which he found odd. Not that any part of the last two minutes had been normal. Slow and as quiet as a man of his size could manage, he jumped to his feet. The muzzle didn’t waver. Neither did his stare. If she moved, he’d be ready to shoot. Glass crunched under his feet as he approached the front of the car. The house alarm blared, but Holden tuned it out. His focus centered on her. Whoever “her” was. “Lift your head.” He issued the order in his best you’re-a-dead-woman tone. To keep from going deaf, he headed for the alarm. Shifting around the side of the car and keeping his body square with the mystery driver, he reached out to disarm the thing. Just lifted his hand and felt nothing but the cool March night air. Snow hadn’t fallen in Northern Virginia this week but the crisp smell signaled what could be a final winter blast. Since he now lacked a front wall that was going to be a problem. Glancing down, he traced his foot through the debris littering what was once a shiny hardwood floor. No sign of the panel, but he did spy his keys. As he leaned down to grab the chain, the driver’s head popped up. She screamed loud enough to make his ears shrivel. The shriek echoed inside his brain, drowning out the annoying sound of the alarm. In two seconds, he hit the code on his key chain to stop the electronic screeching. At the same time, he leveled the gun at the woman’s forehead in an attempt to quiet her down. “Do not move.” When she tried to open her door, he lifted his foot and kicked it shut on her again. In an intriguing and cunning story, Holden battles to keep Mia safe and find out why her boss has targeted the Undercover Recovery Project. I want villains, hand-to-hand combat, and fast-paced action. This series has been giving me that. They’re fun. They’re exciting. They’re what I consider perfect vacation reads. Get ready for one hell of a ride. 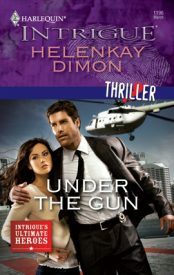 HelenKay Dimon puts the gloves on, throws punches of action at readers one-two, one-two and never lets up until the bad guys are down and out. Another strong book from Dimon, with a messy hero and the heroine he relies on for so much.